The Skinny: Opaque but fascinating crime film/character drama. Lau Ching-Wan and Carman Lee are both excellent, as is Johnnie To's direction. by Kozo: A Hong Kong Cinema change-up. Lau Ching-Wan is a despicable, seedy cop who womanizes, drinks, and neglects his wife (the radiant Carman Lee). 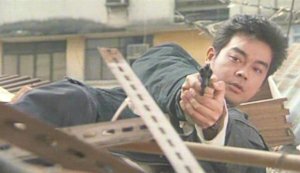 Lau gets a Bullet in the Head from a nasty perp (Tou Chung-Wah) who has a personal vendetta against him. He finds himself incapacitated and needs Lee to take care of him, which is tough for him to take since she’s carrying another man’s child. Also, he loses his sense of smell and taste, and thus must learn to approach life differently. Like Regarding Henry, Loving You is about a guy re-evaluating his life, but it does so in a strange, detached way. Emotionally complex, the film is somewhat hard to read as more is shown rather than told. The storytelling can be frustrating, but it's almost infinitely more rewarding than the usual voice-over exposition you'd see in a picture like this. Credit director Johnnie To, who concentrates on effectively developing his characters.